The cargo airline registered a 6% increment in the volume of flowers transported this year in comparison to the same season in 2016. Bogota, May 12, 2017. 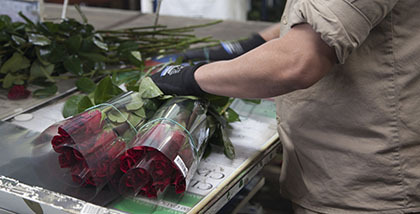 During Mother’s Day season, between April 17 and May 8, Avianca Cargo transported 12.652 tons of flowers from Colombia and Ecuador to Miami, Los Angeles and Amsterdam (The Netherlands). Avianca Cargo transported the cargo in 217 regular flights and 10 charter flights operated in 11 aircraft equipped with dedicated compartments with temperature control systems, indispensable for the care of perishable goods. These numbers represent a 6% growth in the volume of flowers transported for the occasion, compared to the volume transported during Mother’s Day season 2016. Andres Osorio, General Director for Avianca Cargo, affirmed: “We are pleased to actively participate in the celebration of such a special date for families and so important for flower exporters in the regions. Thanks to the commitment and rigor of our human team, we were able to carry out this operation that involved receiving 900 tons at our facilities in Miami each day without setbacks, safely and timely handling a daily record cargo volume”. Avianca cargo is a brand licenses by Aerovias del Continente Americano S.A. Avianca to Tampa Cargo S.A.S., Taca International Airlines S.A, Trans American Airlines S.A, Aerolíneas Galápagos S.A. Aerogal, Líneas Aéreas Costarricenses S.A Lacsa, Aviateca S.A. and a Isleña de Inversiones S.A. de C.V.